The BodyHealt Sock Aid is our pick for the best sock aid, which has an easy to grip set of handles that are made of foam for extra comfort. 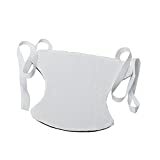 It has an extendable reach of up to 33 inches and can be easily donned due to the minimal requirement for bending over. Our step-up pick is the RMS Deluxe and it can be used for both socks and stockings and has an overall length of 38 inches. It has a 9.5-inch shell and is also a product of the USA. It comes with slip resistant cords as well that are durable. The budget pick is the EVA Medical EZYTUG and it can be used for avoiding back injuries while you are putting your socks on your feet. The plastic core is sturdy and molded to avoid injuries and lack of comfort. The pad is also well-designed to prevent slippage. A sock aid is a kind of tool that you can use to help you get into your hosiery easier in the morning or while rushing. This kind of tool positions your hosiery easily and your feet firmly so that it will become a breeze and less of a chore when you attempt to put on your hosiery right after you get dressed for the morning. It is a convenient tool that most office workers who are on a daily rush will want to have or are already using. They are also a great tool for those who want to get dressed but have a case of bad back or arthritis. Examples of these people may be your grandma or grandpa, or someone who’s had surgery or injury before, or just someone who can’t easily reach their hands to their feet, such as pregnant women. Socks are important because they protect your feet from getting sore and injured by your shoes or other footwear. Socks are simply comfortable and simple to wear if you have enough time to do so. The soft feel and texture of hosiery can help protect your feet from sores that may be caused by the lining of your shoes, especially if it is a new shoe that is still yet to be more comfortable to wear. Socks can be made of different materials, depending on their intended use. They can be made out of cotton at the very most, while divers will wear neoprene socks to keep them insulated. Wool socks are also popular for adding insulation in cold weather. They should also be stretchable at some point so that they will not really restrict the movements of your feet. Putting on hosiery is always a very difficult task, even more than putting shoes on. This is most likely the case for people with arthritis and back bending problems. Having a bad back can prompt you to eventually quit wearing socks because it is painful at times. This is why most people who have this problem turn to the help of a hosiery wearing aid. Socks can also vary in length and sizes. The length of the regular hosiery is usually at calf length and below the knees. Some are knee high and are mostly used in Asian countries for school. The length of hosiery can vary with the weather, as well as the need for overall protection for your feet and legs, especially for sports and athleticism. Size of your feet or hosiery: the size of your feet do matter because not all of these hosiery helpers do have a small or large size. Some are meant for bigger feet while some are meant for kids’ socks. It depends on what you are trying to wear so make sure it counts to avoid hassles. Softness of the grip: for people who have weak grips, it is important to have a very soft grip so that they don’t get user fatigue with their use of the product. An ergonomic and soft grip is what they need, which can be supplied by a foam grip at the very most. Length of extension for the cords: the cords can be somewhere between 28 to 33 inches in total length, while others can also be adjusted depending on how long you want them and how much you can reach. Every person is different and that is why you should go for the right length of the extension for the cords to make life easier for you. Ease of use and operation: you also need to consider something that is simpler to use whenever and wherever you need to put on your hosiery or stockings. It has to be simple and straightforward, especially for the elderly and the seniors, or people who are generally in a hurry. Durability of the body and cords: the body should be durable and it should also be just right when it comes down to material choice. In most cases, you also need to pick something that is lightweight without sacrificing the durability, so that even the weakest patients can use it with little to no effort at all. Intended usage: you should consider who will use the sock aid. Most people who are injured or those with bad back can definitely make good use of it. People who are also recovering from surgery and those of old age can also make good use of this helpful tool in the long run for getting dressed properly for a day to day basis. As our top pick, the BodyHealt Sock Aid can be easily extended up to 33 inches in its length. It is a great footwear hosiery helping tool that requires very small amounts of bending so that you don’t have to hurt your back in doing so, which is helpful for the elderly. It has a durable core and a plastic frame that can withstand the test of time. 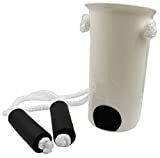 The handles are made of foam so that you don’t injure your hand with the grip, and so you can also grip it with great comfort and softness without slipping away. You can expect an easy on and off with this kind of tool so that you can put on your hosiery without much hassle. 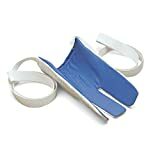 While not a deal breaker, the BodyHealt Sock Aid does have a plastic core that may have some flexibility issues, but this depends on your strength to use it. The RMS Deluxe is our step-up pick, which has a size of 3 x 5 inches and has a total length of 9.5 inches so it fits most standard sized hosieries out there. It has a total length of 38 inches for the cords and the shell so you can extend as much as you want to. The adjustable length is also a great feature for this kind of product, especially for the elderly and the disabled. Its foam handles present a whole new level of comfort while you are wearing your hosiery or stockings. Its plastic shell is quite durable and flexible as well. The cords will less likely slip away due to the innovative design. The product is also backed by a limited lifetime warranty in case something goes wrong with it. 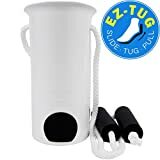 As our budget pick for a nice hosiery helper, the EVA Medical EZYTUG gives you a nonslip grip every single time that you are trying to put in your item to your feet. The comfortable hold will also definitely help the elderly and the disabled when trying to get their footwear right. Its sturdy core is also safe to use and to hold onto, and will not easily break during usage. 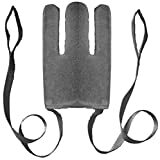 Because of its unique design, it will less likely cause back injury, allowing the person to easily use this kind of tool to help the put on their hosiery without having to bend over too much. You can also use it for a pantyhose, some stockings and the like. You can also adjust the length of the cord as much as you want, depending on who will use the item. The Ableware Deluxe Flexible has a 3-finger design so it can help you feel at ease when putting on you hosiery or stockings without being unfriendly to your foot and heel due to its ability contour to your natural shape. It is made with terry cloth and nylon, both of which are comfortable and durable for you and your feet. It is made for people who are struggling with putting on and off their footwear hosiery. It is also a great choice for those who have just gone through knee surgery or hip surgery because it can help with easily bending without having to bend over too much just to get your footwear just right. The shape is well thought and the design of each contour is fine for most patients and people. The Sofia's 2017 Easy is ideal for pregnant women but can also be used by those who are injured and cannot get down to use their back to wear their footwear right. They are also great for those who do not have a lot of power with their limitations for mobility, such as those with arthritis and back problems. It can also be versatile due to its ability work well with various kinds of footwear. It has a design that is a shoe horn so it can stay on the bottom ground without the need to be lifted elsewhere. It is also packable due to the compact design, which also makes it ideal for traveling around. It can also work on compression footwear so that your feet can stay comfortable. The handle is very comfortable to use as well. The Kinsman Enterprises 32016 is covered in terry cloth and it comes with strap handles. The terry cloth is very smooth and comfortable yet will not sacrifice it for durability. Its strap handles work just as intended and will keep your feet in place. Because of its use as a mobility helper, it can be used by just one hand for the people who need to use it that way. The materials that make up this kind of product are non slip so that you can feel at ease when handling it even with just one hand and with minimal movement. It allows you to easily slide your hosiery without much problems and with little effort, especially for those with muscle and joint problems. It is also made with nylon fabric on some of its parts for added sense of durability. The DMI Deluxe No-Bend is great for patients who have just recovered from their surgery. It can be easily hand washed as a product that can be used for seniors and the elderly, and those with hip, knee or back problems can also definitely use it, as it does not require you to move too much in order to get your hosiery to your feet and footwear. It has terry cloth over it so that it will be soft and durable at the same time. Also, the terry cloth makes it nonslip in its property, preventing you from getting into any unwanted accidents while you are using it. Another addition to the friction is the lining in which is made with nylon for added force that can help you use your hosiery helper just right. The Norco Easy Pull is also a nice hosiery helper tool that has three fingers in its design and can be easily hand washed due to the material’s softness and compact design. Because it is small and portable, you can easily take it with you wherever you need to go and it is very lightweight as well, unlike other types of hosiery helping tools out there. It has a large loop set on the handles so that you can definitely depend on it even if your grasping power is not that strong. The outer covering is made with terry cloth so that your hosiery will stay secure when you are putting it on. The contour bending is thanks to the plastic core slits to go around the heel. The straps measure 32 inches in total. The Healthstar Molded Plastic is great for people who have arthritis or similar mobility problems, especially those with a bad back. 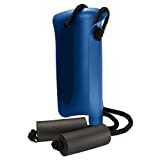 It can span up to 30 inches in length for its cord and it is easy to grip for its foam handles, which are also extra large so that even the person with a weaker grip can definitely make good use of it. You don’t need to bend too much when you are using this kind of product. The plastic frame has been properly molded so that it will fit your feet much easier than when you try to do it manually, especially for those with mobility disabilities. The length is just right for arthritis and joint pain patients and it can also be used by people who stay in chairs or the bed for too long. The Vakly Soft Flexible is a nylon lined design that also has the 3-finger design which makes it easier for you to contour around your ankles and feet. The ease of usage is thanks to the reduA: A sock aid is a kind of ced friction of the nylon lining. Another addition that makes it less slippery is the fact that it is also made out of terry cloth on the outside part of the sock aid. For those with limited function in movement, such as those with bad backs and joint pains, this is a great product for you. The loop handles measure a total of 28.5 inches so it is great even for smaller and shorter people. Its plastic core is flexible and strong and is also pretty durable for the price. Other sock aids were not in our list because they lacked in durability and grip comfort. It is important for someone who is using a sock aid to have the right kind of comfort and ease of use because that is what they are looking for in the product. Q: What is a hosiery helping tool? A: A hosiery helping tool is a kind of mechanism that helps a person to wear the foot hosiery properly. It is a very helpful thing that can be used by those with limited motion such as the elderly, those with injuries or those with osteoarthritis or joint pains as well as back pain. If you have trouble when it comes down to putting your foot hosiery properly and bending over to put them then you might as well have this tool. Q: How do you use a hosiery helping tool? 1. Make sure you are holding the hosiery on the top foot side. 2. Make sure you are holding the hosiery helping tool on its under curve underneath your foot. 3. Slide the hosiery onto the top of the hosiery helping tool to fit it in. 4. Pull the toe part thoroughly so that everything goes into the hosiery helping tool. 5. Make sure that the hosiery opening part is near the strings. 6. Hold on to the rope of the hosiery helping tool with two hands. 7. Drop the hosiery onto the ground (but don’t break it!). 8. Put your foot into the hosiery helping tool and into the hosiery as tight as possible. 9. Pull off the hosiery helping tool from the foot hosiery you just wore using the rope. Q: What are the symptoms of osteoarthritis? Most forms of arthritis can cause pains into the joints of a person, such as aching backs, knees, elbows, shoulders and the like. They also get stiff joints because of the aforementioned arthritis, which is quite painful and keeps them less in mobility. They also have limited motion capability because of arthritis. This is why most arthritis patients have a hard time in doing things on a daily basis. Most arthritis patients, in severe cases, can have enlargement of joints as well. Along with that, the arthritis patient can also have joint swelling, which can be painful, indeed. Most often, since the affected part of the joint is very painful, the arthritis patient can also experience tenderness or weakness of joints. This is a kind of movement that is a symptom of arthritis, in which some grinding or cracking sensations can be felt. The biggest problem with arthritis patients, when it is not left treated or handled, is that it can result with misaligned or deforming joints. The problem with arthritis is that you also get unstable joints when you move from place to place, limiting the movement of arthritis patients. You can also get inflammation for your joints if you have arthritis. Q: What are the causes of osteoarthritis? Most arthritis patients also have parents and relatives with the same kind of situation. There are some studies that link arthritis to obesity. Sometimes, the way people digest foods can be linked to arthritis. If you have severe injury then that can lead to arthritis. It can also come from certain infections, like injuries. If you have SLE and RA or any other form of autoimmune disorder then you may also be a candidate to osteoarthritis. Most commonly, arthritis is caused by old age. Q: What are the treatments for osteoarthritis? Q: Why should you wear foot hosiery? 1. They keep your feet comfortable. 2. They keep your feet safe from sharp edges of shoes or footwear. 3. They keep you warm during the winter or cold days. 4. They can provide stability during sports or physical activities. 5. They can help prevent sport injuries if they are compression foot hosiery. Q: What are the different kinds of foot hosiery? They are simply like low cut shoes but are foot hosiery. They are the most commonly seen and used ones, and have a medium length above the ankles. These are pretty long and can span form 6 to 8 inches in its length. The mid calf type can go up to your calf muscles, but usually don’t go past your calf area. Calf length ones go over your calf muscles. They are very long and can be part of a uniform. They go up to your knees. These are longer than the knee foot hosiery because they go up to your thigh like stockings. The slip-on is something that ladies would mostly wear, but men also do. They are thin and are mostly meant for low cut anything. Q: What fabrics are used for making foot hosiery? There can be different kinds of cotton, but organic ones are the best. They are great for keeping you comfortable and feeling lightweight. They are also very easy to wash and to take care of. If you want more flexibility for your foot hosiery then do consider spandex. It is also known as Lycra or Elastane, and is a great way to make your foot hosiery easy to wear. Most cotton foot hosiery today do have some manner of spandex in their composition. If you don’t want something that puts too much moisture when you sweat, go for something synthetic like polypropylene, also known as Olefin. It is a kind of material that can be moisture wicking, so it is great for those into sports. For a durable design and material for your foot hosiery, do consider something that is made, or partly made, out of polyester. They are also very easy to add dye to, so you can have various color choices and designs. Wool is also a common and important hosiery material, mainly because it is one of the best ways to keep your feet warm in the winter. They can be great for keeping your feet dry in the winter and in humid times. This comes from the Cashmere goat and can also be a little more expensive. It is very comfortable, soft and is considered one of those luxurious fibers out there. They are also lightweight to wear. New to the scene is bamboo, which is shelping tool to have better antimicrobial properties to keep away mold and mildew from your feet while you sweat away. It can be a little more expensive, like most products that are derived from bamboo. Also known as linseed, flax plants can be harvested with fiber so that you can make into something like a hosiery. It has good durability but the elasticity is not that good, so it is often added with other materials to make it more flexible. Also a very well known durable kind of material like polyester, nylon is great for a longer lasting pair of foot hosiery that might last for years to come. Another luxury kind of material, silk is more often used for really expensive foot hosiery and are great for insulation. The tensile strength is very high and can absorb moisture. Acrylic is a kind of fiber that has some weight but not too much. It has great colors that will attract people and the warmth is also just right with the softness. This comes from the Angora rabbit’s fur or hair, so it will make your foot hosiery look more fluffy. It is not taken by force – rabbits that are molting are the source of the fur. This is a kind of polyester that works similarly, but is more moisture wicking in its properties as compared to the regular polyester that you can find in stores. This is a kind of Olefin fabric that is meant to be moisture wicking and can also prevent the likelihood of bad odors from your foot hosiery. This is due to its antimicrobial properties. This is a combination of spandex and nylon or one of each that is added to nylon, so that it will be much more stretchable. A metallic like material, this kind of thread is used for adding glittery patterns to your foot hosiery so it looks unique and stylish overall. Coming from the Angora goat in its silky coat, this one is similar to wool but stronger and are ideal for dyeing and coloring. This one is made from beech trees and are better than cotton when it comes to absorbing water and moisture. It also holds dyes much better than cotton. Coming from plant fiber, this kind of material has great absorption of moisture so it is great for athlete foot hosiery and the like. This kind of material adds stretching ability to any kind of synthetic or natural material. Rubber is naturally made and derived from rubber trees and is very elastic. Q: What are some myths about arthritis? Arthritis can affect any age. Only cold weather can bring about arthritis. Even those in warmer climates can have arthritis. There are cures for arthritis. Actually, it doesn’t have a direct cure, but there are things you can do to alleviate its symptoms. Poor choice of foods can cause arthritis. No scientific evidence has been given for specific foods, but only for weight maintenance. Only aches and pains are the effects of arthritis. Actually, sometimes your bones may tend to get joint damage. If you feel fine then you might not have arthritis right now. Because arthritis is an unexpected disease, it can strike anytime so don’t count on feeling fine for too long. If there’s no cure for arthritis then you’re doomed for life. Not so – there are some ways you can improve life with arthritis. Q: What are some misconceptions about running foot hosiery? Foot hosiery are a one size fit all. Not exactly, as some people can have foot hosiery that are too big and some are too small and uncomfortable. If you feel the foot hosiery in your hand that it is soft, it must be soft on your feet as well. Just because it is soft doesn’t mean it’s the best – it should also be durable at the same time. Getting blisters is essential to be a real athlete. Not exactly – it just means that you need a better hosiery or shoe. Running in no-show length foot hosiery are better for you. This varies depending on your preferences, as some do like to show their foot hosiery while running. Only inured people have the right to wear compression foot hosiery. Actually, all people, especially athletes and those who work out, should definitely go for compression foot hosiery as well. This is because it can protect you from fatigue and potential injury later on. Q: Is it okay to wear foot hosiery in the summer? A: Foot hosiery and summer don’t always go together, but there are some instances where you absolutely have to wear foot hosiery, specifically for dress codes in the office or at school. In this instance, consider going for breathable foot hosiery that barely feel like you are wearing them. Q: Which foot hosiery go for which occasion or activity? This one is ideal for going to the gym, playing sports and other physical activities. You can also go for a darker color if you wish to hide your sweat away. These are meant for formal and semi-formal wear, such as dresses and the like. They are thinner and much more breathable than athletic foot hosiery because they don’t have to be compression foot hosiery at all. These are ideal if you want to wear shorts instead of pants, because shorts will make your foot hosiery look funny, unless you want to look square or unique in your office. Colored foot hosiery should be in match with your pants, not your shoes. If you have brown pants then consider brown foot hosiery and then black shoes. Otherwise, go funky and creative! These are for those who want to make a statement of individuality for their everyday wear, other than plain old boring foot hosiery. Q: Does hosiery color and style say something about your personality? A: Yes, foot hosiery have something to do with personality, as with most fashion items. Most people who wear brightly colored and uniquely patterned foot hosiery tend to be more creative, outgoing and like to think out of the box while those who wear plain old boring colors like brown, black and white tend to be more reserved, organized and systematic. Q: Can foot hosiery and shoes help in triathlon? 1. It helps them keep their feet clean. 2. Neoprene foot hosiery help a lot with water courses. 3. Transitioning from swimming to biking with foot hosiery helps reduce friction. 4. The overall drag is reduced. Q: What are the differences between foot hosiery and stockings? a. Stockings can go up to the knees and up to your thighs. b. Foot hosiery can go knee-high but it depends on the type of hosiery you have. Q: What are neoprene foot hosiery used for? A: Neoprene foot hosiery are not like your ordinary foot hosiery, as they are mostly used for wet environments, sporting, humid situations, boating, water sports, cold areas of the world and the like. Basically, anywhere where you know you will get wet, you should definitely arm yourself with neoprene foot hosiery. Q: What are the differences between sports foot hosiery and regular foot hosiery? 1. Sports foot hosiery – they are mostly made of synthetic or wool instead of cotton because cotton is a moisture retaining material that can mess up with your performance and make you feel sweaty all the time. Sporty foot hosiery are also very flexible and can be a great companion when it comes down to preventing injuries. The compressed design of the sport foot hosiery makes them ideal for keeping your feet as stable as possible and can even be worn in sweaty, damp environments. The sport hosiery can be used in events such as when doing water sports. They usually keep the sweat away from your body so that you won’t easily get sick and your feet won’t be the breeding ground for mold, mildew and other bacteria and sickness causing germs that might form when your sweat retains in your feet and toes when you play a sport or do a physical activity. 2. Normal foot hosiery – they are mostly based from cotton material and can sometimes also be made with polyester. The reason for this is that they are meant only for minimal activities such as staying at home, office work, going to school and the like. They are not meant for sports because they retain moisture and sweat, which can be bad for your feet and toes because of the problem of mold and mildew that can infect your feet. Therefore, you should not always depend on them during the rainy days. If ever you wear foot hosiery and you have no choice but to go through flood or a rainy weather, or even a snowy one, you should remove your foot hosiery right away and disinfect your feet so that it will not become the breeding ground of mold and mildew, which only comes during high moisture moments and instances. Q: Why do foot hosiery get holes eventually? 1. How often do you use it? A span of 2 years is usually the highest norm for a hosiery or a pair. 2. Under what conditions do you normally wear it? If you wear something in the rain more often, it can definitely deteriorate much faster than in dry areas of the world. 3. What are the materials that make it up? The most common materials that are used for foot hosiery include cotton, polyester, spandex and nylon. If you have more materials made of synthetic ones than organic cotton then durability is much better, but the comfort and softness might not be that good. 4. What kind of hosiery do you have? Most often, foot hosiery that are meant for dresses and formal occasions are prone to having more holes than regular ones and those that are meant for athletic purposes or for sporting. Foot hosiery that are thinner are the ones that will deteriorate much faster than thicker ones. Q: What some of the most common foot problems that people can experience and how do you treat them with footwear? 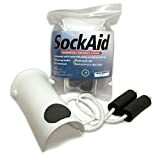 In the long run, we think that the BodyHealt Sock Aid is our pick for the best sock aid due to the very long reach of up to 33 inches, which is helpful for most patients who have bad backs or arthritis problems and thus cannot easily put on their hosieries and pantyhose or stockings for their shoes or other footwear. The soft foam speaks for itself and gives extra comfort and ease of use for the injured/elderly person.